It was 8.32am on a Tuesday morning, the day before was a Monday bank holiday and we had worked throughout the night to make a deadline we thought we would never reach. The magic command was executed in a blinking terminal and the first version of our web application, Rightlance, was available for all to see. I emailed the client that was expecting a version to use on that day, closed my MacBook and went to sleep. Unexpectedly, the journey up to this point had taken exactly three years and seven months. It was at that time where I had just left a marketing company I founded, and conceptualised the idea of a platform that helped creative businesses work with their freelancers. I built the prototype in poorly coded PHP and a very basic implementation of the Foundation framework. 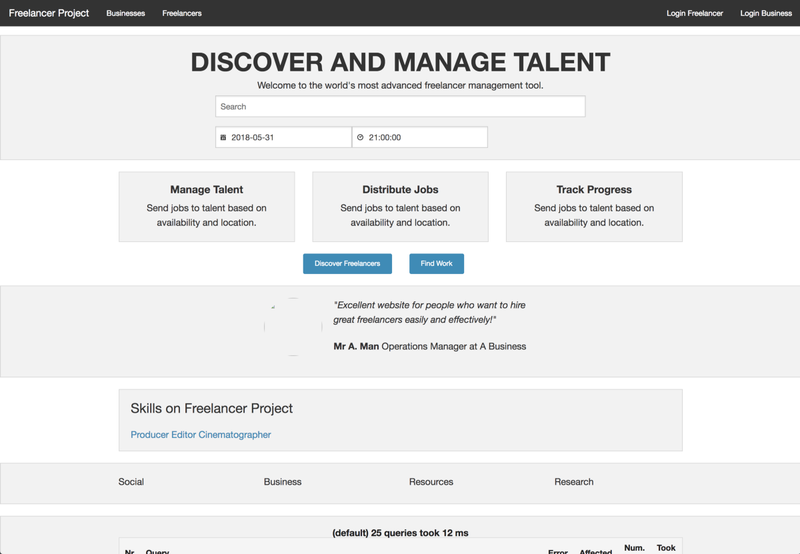 The prototype was aptly named “Freelancer Project”. To my surprise, it actually worked; businesses could discover freelancers that were available where and when they needed them. I even built in Google Calendar integration — it was time to get some clients on board. At least, that’s what I could have thought, instead, against commonplace theories of agile product launches, I knew now was not the right time to launch. Why? Simply put, I am an advocate of excellence, or at least the pursuit of excellence. I wanted our users to experience the extraordinary when they used our product, to be blown away by being able to complete previously complex tasks in a simple, intuitive way. I wanted a product that would scale sustainably. I wanted the design to be impeccable, for our users to experience excellence throughout each aspect of our app. You see why the prototype didn’t meet, or even attempt to meet, those standards? I realised that any attempt at achieving them would be impossible on my own. By chance, my housemate at the time was in charge of a creative agency, his business partner and one of their employees quickly bought into the idea and decided to come on board in exchange for equity. Honestly, I think if they knew the journey that was about to unfold I’m not sure they would have had the same willingness to spend their time building Rightlance. We quickly discovered that what was required was a lot more than a simple polish, that actually we would need to do several revisions of the UI, a few database restructures, some major refactoring, codebase changes and eventually an entire rewrite of our backend structure (about a year and a half before we hit that live button). Why did it take so long? It wasn’t simply because we set such high standards for our product, we actually had very little spare time in our day jobs. I was completing a film degree that led to work across the world as a filmmaker, my partners were running their creative agency and all in all we probably had a few hours a week to work on the business in the beginning, yet we decided to never let quality slip. Years passed and we finally could release something we were proud of. Was it perfect? No, not by a long way. But we can truthfully say we have pursued excellence through every feature, every click, every micro interaction and any possible touch point we have with a user. I believe this methodology not only built a great Beta release but also has helped build a foundation for Rightlance to prioritise the experience and productivity of our users over rushing something in name of ‘progress’. Now, I’m in no way advocating that every product should take four years to launch, I’m simply saying that taking your time is okay too. Set out your values, understand what you want to achieve and then go for it. Don’t release something you’re not happy with or feel you have to get a product out there to ‘learn about the market’. There are numerous other ways to understand what your customer’s pain points are and what they require in their day to day. If you’re worried about financial risk, well, that’s fair enough, however, you shouldn’t let that control your actions. Starting a company at any point is risky, if you’re bootstrapped you may just have more chance of starting something successful if you spend time getting a great first release. It’s completely unknown as to how Rightlance will progress, as we continue to learn more about our clients using the app, we can continue to put our methodology into practice; everything we do is with excellence with the end user’s problems, needs, and objectives in mind.